As distractions go, sports provide a good one, perhaps preferable to Hollywood superhero movies, especially now that Hollywood seems to have run out of superheroes to make movies about. In the winter and spring, basketball and hockey provide a nice indoor reprieve. In the spring, summer, and fall, the baseball season is blissfully long. And if watching and playing baseball is as American as apple pie, then surely football is as American as a half-gallon of Chunky Monkey ice cream on top of your apple pie. As the surveys and revenue will tell you, of the four big American sports, football leads the pack. Even with all-day Sunday, Monday night, and Thursday night football games, Americans can’t get enough, and with so much pleasure to be had, it would be a shame for other countries not to share in the glee. If only our borders were more porous, then our favored sport would have an easier time achieving its manifest destiny. Not to be deterred by barriers to its progress, the NFL has found one way to expand into new markets: put two teams on an eight-and-a-half-hour plane flight and send them to England. And so a few weekends ago, not only the British peoples but also some early rising Americans were treated to a game between the Miami Dolphins and the New York Jets at Wembley stadium. What a pleasure it was to see the English on their side of the pond, not ours, dressed in NFL jerseys of teams from all over the U.S. Any Yank with a shard of patriotism should have been delighted. The British have enjoyed so many successful invasions of our country, it’s about time we repaid the favor. Not only is this world-branded football a popular sport everywhere, but it’s already made serious inroads into the homeland. Drive around any suburb on a weekend or weekday evening, and you’ll encounter this co-ed, covert sport: boys and girls of multiple ethnicities chasing a black and white ball, running back and forth on fields once reserved for football, field hockey, and lacrosse teams. And to boot, all of this behavior is encouraged by moms and dads, parents who have come of age long past my boomer generation. In the face of such growing acceptance, it would seem that the jersey for other traditional American sports has been sewn. I haven’t done extensive research, but many reputable soccer proponents claim that playing their game has several advantages: first and foremost, less concussions than, say, football. Soccer also doesn’t require purchasing as much equipment, so it’s “more democratic.” Along these same lines, American girls seem to be taking to the sport. Health enthusiasts also claim that the constant running may provide a better cardio workout than standing around a huddle and waiting for commercials to end, as sometimes happens during football games. There are international socio-economic and political ramifications as well. 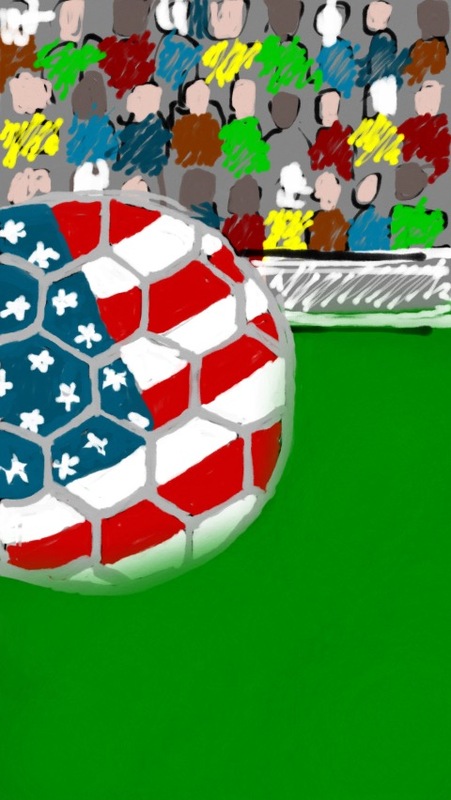 Some suggest that as soccer-loving nations engage with one another, a kind of modern-day ping-pong diplomacy takes place. Efforts toward this goal have already occurred in other parts of the world: the Middle East, Asia, South America, and Africa. Rather than fighting wars, the hope is that these soccer-engaged nations and their city-states will become distracted by player personalities and upcoming games, tempering social and economic bickering with harmless banter about who’s team has the better striker. With these pluses, I admit, fans of the big four traditional American sports, boosters who can’t fathom the attraction of playing a game where heads take precedence over hands, will either have to get with the program or watch a lot more ESPN Classic. All that said, our nation should recognize that we have a choice. We can either take back our children and place their permissive soccer moms and dads in detox, driving out the invader’s influence, or we can do nothing, let world sports culture run its course and, like a disfiguring toenail fungus, take us over. What’s the answer? I think most of my fellow boomers would agree with me and hope for the former. We hate soccer. We can only watch the game on television once every four years when there’s nothing on the internet. The player action is too spread out, and the game is hard to follow. The cards are red and yellow and not red, white, and blue; players hardly ever get hurt; and with few exceptions, the U.S. men’s team gets knocked out in the early rounds. Judging by current trends, however, we lovers of traditional American sports may all have to eat less apple pie and ice cream and watch more soccer. We’ve managed to change before. In the 1970s, we adjusted to Opie becoming Richie Cunningham. In the 1980s, we made the move to smaller cars. And in the 1990s, we endured the passing fad of bigger SUVs. Clearly, we are a people built on flexible character. Our capacity to change may be limited, but never underestimate the heart of a true champion. If we can get more creative with camera angles, find announcers who will explain the game to us, set up more hot dog and Budweiser stands in foreign stadiums, and teach the international players to speak English, we might learn to appreciate this strange and challenging game. This entry was posted in Uncategorized and tagged football, NFL, soccer. Bookmark the permalink.